Minutes of the last General Membership Meeting are available at the link below. Detachment members are asked to review these minutes in order to keep up to date with current business and events. 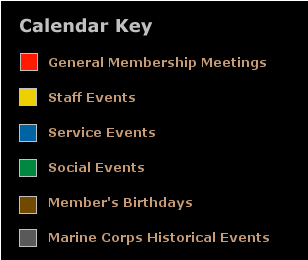 An interactive calendar displaying our meetings, social events, service events, member's birthdays, and dates of historical significance in Marine Corps history is provided below with each type of event indicated with a different colored marker. All events are clearly indicated on their respective date. Additional information, such as times and locations for each event, can be located by clicking on the event's colored marker. Where applicable, a link to a map to assist you in locating the event's location is also provided. You may also use the calendar's interactive controls to toggle between months by depressing the previous month symbol (<) or the following month symbol (>) at the top of the calendar.